Senior Azeem Victor was expected to lead Washington’s defense. But after two suspensions, it’s up to Ben Burr-Kirven to take down Penn St. star Saquon Barkley in Fiesta Bowl. The player who stepped in for the Huskies’ best returning defender in 2017 now gets to be in charge of stopping the perhaps the college nation’s best all-purpose back. 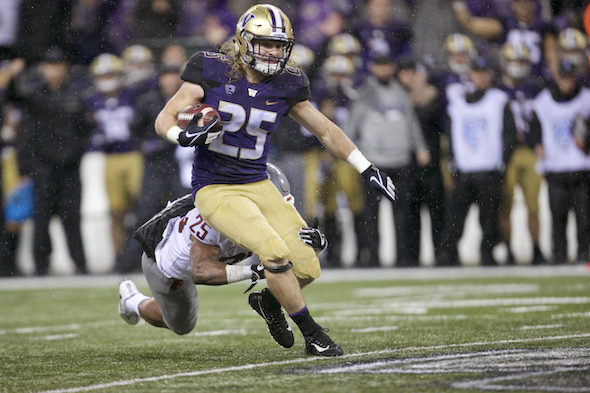 If MLB Ben Burr-Kervin pulls it off Saturday afternoon in Glendale, the good-as-new repair will stand as a significant achievement for Chris Petersen’s regime at Washington. Replacing Azeem Victor, a first-team preseason All-America selection and likely high-round NFL draft choice ahead of his fifth-year senior season? Implausible as it seemed, Burr-Kirven is a few Saquon Barkley take-downs at the Fiesta Bowl (1 p.m., ESPN) from making his own dent in the national football consciousness. “Incredible challenge,” he said after a recent practice prepping for ninth-ranked Penn State’s best player, who finished second in the nation in all-purpose yards (179.5 ypg) with 1,134 on the ground, 594 in receiving and 426 yards and two touchdowns on kickoff returns. But Burr-Kirven made a point that Washington’s defense takes a friendly-fire pounding from players virtually the equal of the 5-11, 230-pound Barkley. In fact, Gaskin, who could break Napoleon Kauffman’s career record for rushing yards at Washington (4,106) Saturday, out-gained the more heralded Barkley in 2017. His 1,282 yards was fourth in the Pac-12 and 25th nationally. Barkley, a pre-season Heisman Trophy candidate, finished 34th. So Burr-Kirven’s point of comparison is well-taken. So is his comparison to Victor, who was leading Washington in tackles a year ago until breaking his leg with two games left in the season. A junior, Burr-Kirven (6-0, 222), who leads Washington in tackles with 79, isn’t as big or fast as Victor (6-3, 231), but he’s equally aggressive and a tad more reliable. Victor, a first-team All-Pac-12 choice as a junior, was expected to be the anchor in the middle of Washington’s defense, but was suspended for the season opener, reportedly for a failed drug test that UW wouldn’t confirm. But he made only five starts, eventually moving to a hybrid end/linebacker position as Burr-Kirven demonstrated he could cut it as a defensive leader. Then Victor was arrested in Seattle in mid-November on suspicion of DUI, and Petersen suspended him for the final two games. Petersen this week in Phoenix ended speculation about a bowl return by declaring Victor out for the game. A source told the Seattle Times that Victor has signed with an agent, ending his eligibility. He has already graduated. When asked directly during the season whether Victor’s playing time had been reduced for non-football reasons, Petersen said flatly no. He praised Victor’s play when merited, and didn’t disclose any shortcoming. That leaves open the possibility that the recovery from his injury was incomplete. And it also leaves open the notion, first seen when he suspended future NFL star CB Marcus Peters, that Petersen cares nothing about reputation and only about results. Whatever happened to Victor, Burr-Kirven picked up the slack and helped the defense finish fifth in the nation in total yards (277.4 ypg) and get back to a big-time bowl game. After meeting Alabama in Atlanta in the College Football Playoffs a year ago, Burr-Kirven, a Pac-12 All-Academic first-team selection, hinted that the intense spotlight was a bit daunting. Regarding taking the measure of powerhouse Alabama, he said, “Yeah, they’re a big physical team, but the thing that killed us was turnovers and mental mistakes, not really a physical aspect. The Northern California defensive player of the year out of Menlo Park, Burr-Kirven was a well-regarded recruit who knew little of UW until he heard Petersen’s message during a recruiting visit. That’s perhaps the key to Petersen’s success in recruiting, following a purported top-10 recruiting class announced two weeks ago — an intense but low-key sincerity absent the smoke-blowing of many of his contemporaries. “The biggest thing with him is he seemed the most genuine to me,” Burr-Kervin said. “In recruiting, some coaches tell you you’re going to start right away, and it all sounds good. But at the end of the day, a lot of it is hogwash. He told us if you’re good enough to play right away, you’ll play, if you’re not, you’ll redshirt, and it’ll be the best thing to happen to you. I trusted him as a coach and a man. That’s as good an explanation as any for Washington’s 22-4 record the past two seasons and appearances in consecutive major bowls. Whether recruits or players, Petersen is unafraid to be straight-up with all, and partial only to performance. I did not expect the Dawgs to have an undefeated season but they really could have. This bowl game will be the telling tale. Sad to see that Victor won’t be a part of this but hopefully his teammates hear the message that Coach Pete is sending out. I think losing LT Adams and WR McClatcher were larger blows than many realize. I thought the McClatcher blow was the biggest loss. T.E. loss also huge. “A telling tale?” How so? They are a 10-2 team, playing a 10-2 team. Neither team has anything to prove. Both are very good– an excellent matchup. If I could have any coach in America to coach the Huskies…..I would pick Chris Petersen. He is the total package for the University. The biggest thing in terms of career arc is that this was always a destination for him, not a steppingstone. Coach Pete is the second coming of Don James. Nothing less, other than there won’t be the cover-ups to keep bad-actor players on the roster. All I gotta say is thank God for Utah. Utah’s win over West Virginia could easily end up being the Pac-12’s only bowl win of the post-season. I doubt the Dawgs will prevail over Penn State but let’s hope they, unlike the Cougs, at least put on a respectable performance. This may be a game where Petersen goes all Boise State on the playbook. I can’t help but wonder what the probability of Azeem playing in the Fiesta Bowl would have been had he not signed on with an agent. I too hope the Dawgs make a game of it. I think after the arrest, there was no chance of return. Victor needs to put everything into proving he can be as responsible a pro as he is talented.